Ever have one of those evenings when you just don’t feel very decisive about the type of wine you want to drink? When the weather is very warm my choice is easy: white wine or rosé. As the weather cools I’m all in for red wines. It is during the in-between seasons that I feel most indecisive. I’m not ready to give up on white wine and rosé, but it may be too warm for a heavy red wine. We recently received three wines as tasting samples made by long-time Rhône producer Ferraton Pére et Fils. It was as we tasted these wines over several evenings with a variety of food that I realized how versatile these wines are and how enjoyable they would be through several seasons. The three wines we received are from the négociant range of wines produced by Ferraton Pére et Fils. The winery was founded in 1946 in Hermitage located in the northern Rhône Valley by Jean Orëns Ferraton. Jean’s son Michel expanded vineyard holdings and production through the 1960s and 70s. In the late-1990s, under the guidance of family friend Michel Chapoutier, family-owned vineyards were converted to organic and biodynamic viticultural practices. Today, Damien Brisset is in charge of winemaking which includes three ranges of wine: selection parcellaire (parcel selection), lieu-dit (named place) and tradition (blended, négociant wines). Ferraton Père et Fils Samorëns Côtes du Rhône wines are part of the négociant range of wines. 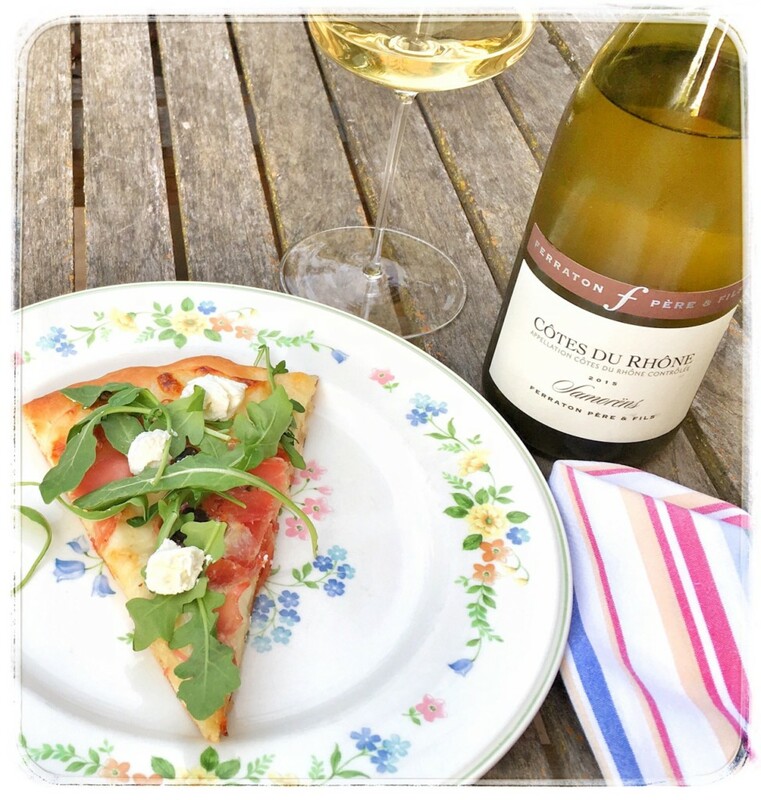 2015 Ferraton Père et Fils Samorëns Côtes du Rhône Blanc — pale yellow in the glass with earthy, delicate floral aromas. Stone fruit flavors mingle with dry-gravel minerality and a hint of dried hay. The wine has a nice weight in the mouth and a clean, crisp finish. 13.5% abv. $14. Cork closure. This bright wine is a blend of 60% Grenache Blanc and 40% Clairette. If these grape varieties are unfamiliar to you here is the opportunity to introduce yourself. We enjoyed this wine with a mozzarella, dried fig, proscuitto, goat cheese and arugula pizza. Perfect for a warm weeknight dinner, but don’t overlook this wine’s potential to pair with roasted chicken or creamy pasta dishes as the weather cools. 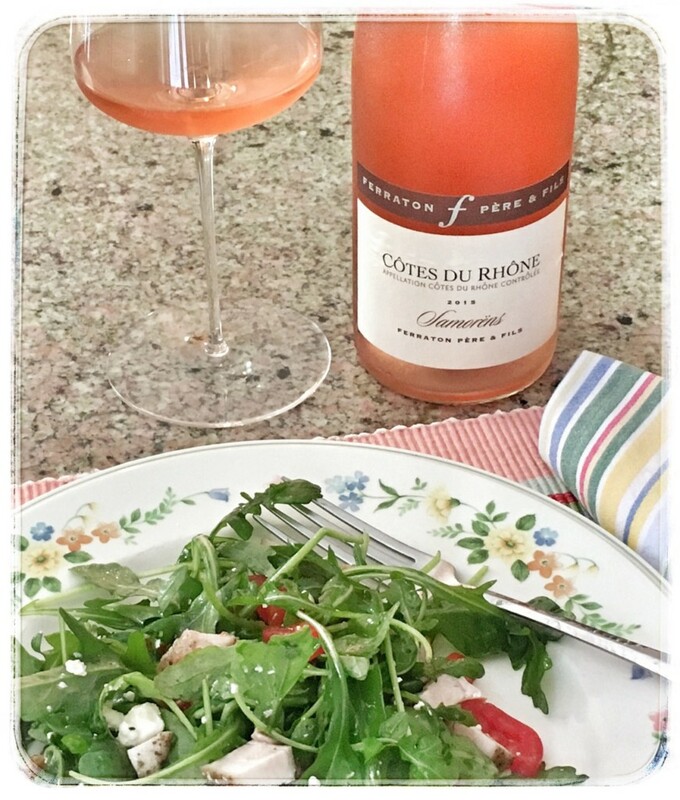 2015 Ferraton Père et Fils Samorëns Côtes du Rhône Rosé — salmon-pink in the glass with generous floral and mixed-berry aromas. Blackberry and strawberry flavors are seasoned with herbal backnotes and just a hint of nutmeg. A juicy, citrusy acidity keeps the wine bright and lively. 13.5% abv. $14. Cork closure. 75% Grenache is blended with Syrah and Cinsault to produce this flavorful wine. It is a taste of summer in the glass and was the perfect partner for a light salad that included grilled chicken, tomatoes and feta cheese. Enjoy this wine now on a warm evening. 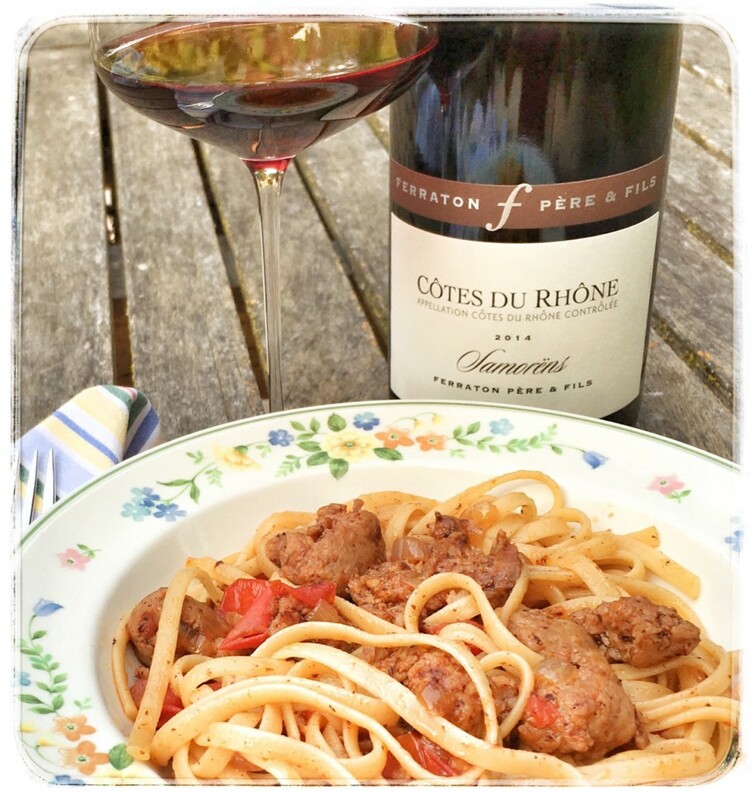 2014 Ferraton Père et Fils Samorëns Côtes du Rhône Rouge — medium ruby in the glass with complex aromas of blueberries, blackberries, black pepper and savory notes. Equally complex flavors follow with a combination of dark and red fruit, that same savory flavor that appeared in the aroma along with black tea. Tannins are smooth and the finish is quite long in this light to medium-bodied red wine. 13.5% abv. $14. Cork closure. This wine has such lovely aromas I was reminded of a friend who would describe such a wine as “tasting optional” meaning the aromas were so wonderful he didn’t want to stop enjoying them long enough to taste the wine. Sometimes when a wine delivers beautiful aromas the flavors don’t compare favorably; that’s not the case with this wine. Surprising quality and complexity for $14. The blend of 85% Grenache, 10% Syrah and 5% Cinsault hits the mark. The wine was just as delicious on the third night as it was on the evening we opened it. We enjoyed this red blend with Italian sausage and tomato pasta. It was perfectly enjoyable on a warm evening because in spite of the amazing aromas and flavors it is not at all heavy or alcoholic tasting. But, those amazing aromas and flavors that would make this red wine just as enjoyable on a cold winter evening. A truly versatile red wine. 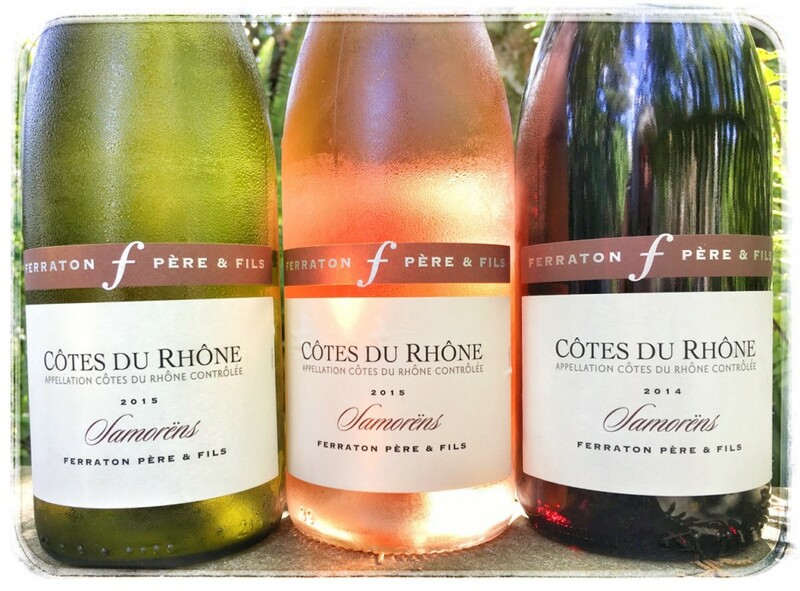 These delightful wines from Ferraton Père et Fils are distributed in the U.S. and offer fantastic quality for the price. Additional wines in this range to look for incluede: Côtes du Rhône-Villages Plan de Dieu, Crozes-Hermitage “La Matinière” and Chateauneuf du Pape “Le Parvis” Ferraton. Thanks to Creative Palate Communications for sharing these wines with us.